You think, well, maybe at some point you’ll stumble upon the link between the park and the body, that somehow there’ll be a connection. Or the Park and the City. Or something. You cannot imagine what it would be like to live in another part of this City – other parks, other shops, other streets. Moving to Kennington or to Notting Hill or to Camden would be like moving to another country. That’s how it feels. I know some people who have lived in ten different parts of London in just as many years. You like the repetition of things – or you imagine you do – the paths trodden and retrodden, doing the same route over and over. You’ve never thought of these things like this before but now you do. You think of how familiar you’ve become with certain noises, sounds, humming and whirring and police sirens, too, that go up and down this road you live on at least once or twice a day. And you suppose there should be reassurance in that – for isn’t repetition and habit and ritual supposed to calm one, make one feel connected to… I don’t know… place? a higher force? The repetition of running is what calms me. The repetition of paths. I like that. I like knowing the path that circles the Park, knowing it intimately, the chipped bark, the mud, the grass, the moment it turns from earth to macadam. The feel of it under my feet. The softness, like a sprung dace floor, that is the path covered in chipped bark. I like running on that. But yesterday even the softness of the paths couldn’t keep my left knee from hurting. Even the support that I used didn’t help. I managed to get from home to the Park, then from Whitehouse Gate to the paddling pool, before I turned back. Turn back in pain. I walked home from Whitehouse Gate, along Mountgrove Road… and the sun was shining, the sun was out and it was warm and glorious and the pain had subsided and I felt light, my step felt bouncy. Sunshine changes everything. Ah yes, but even that, when I lived in hot places and the repetition of heat and sunshine was a given – even that became too much to bear, the body always sweating, its water always in need of replenishing. The gates divide the Park into sections, and each section is different from the other, so that the run itself never feels like repetition. There is always something ahead, something different, something expected and known,but different. The section from Robinson Crusoe Gate to the Paddling Pool is not his favourite part of the Park. On the right: Chruch Street and the bus stop, the New River Cafe, the turning into Clissold Crescent, and the council estate, where a man he likes and who he meets up with regularly lives with his ex-boyfriend. And just beyond that, the house where he first lived in Stoke Newington, on the floor of a friend who was dating a married man. On the left: the Park and trees that are now overflowing with leaves and green, like inflated balloons. People picnicking on the grass, playing football, and a fat man in too-tight clothes walking towards him on the Path. Men alone in Parks are guilty until proven innocent. Anyone alone in nature is a strange thing. In a cafe – fine; at a museum – fine, but alone in a Park (or at the Cinema, perhaps, too) is suspicious. Like an animal alone in the wild, isolated, removed from the pack. And somehow running in the park absolves you from this. This stigma! For you are like an animal… running towards something or back to something, running in pursuit of something or away from something. 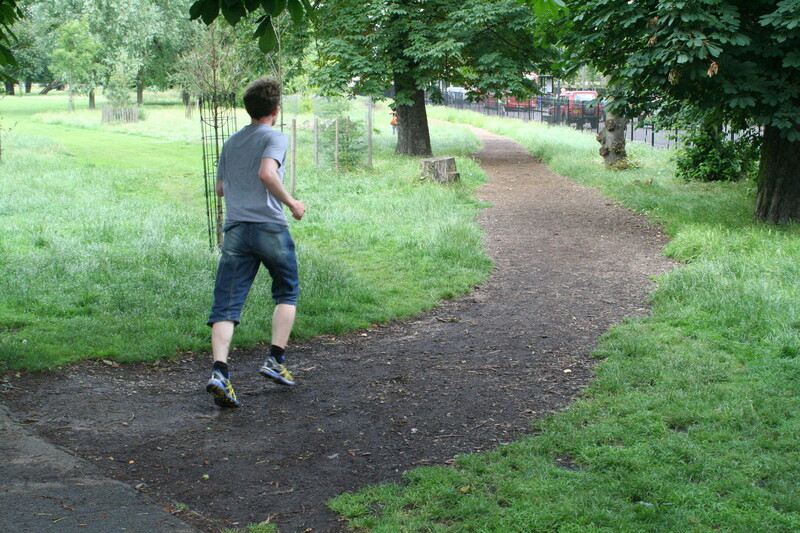 A man running alone in the park is a reassuring thing. Unthreatening.